On the Friday morning at Feilding there were two Air Tractors, both AT 402B models. ZK-JHG (c/n 402B-1021) is the "new" Airtractor for the Rural Aerial Cooperative Ltd of Pahiatua. The original Airtractor ZK-JHG was registered on 24/1/97 but was badly damaged in a landing accident on 17/2/17 at Kumeroa East of Woodville. Some parts were returned to the factory but it is essentially a new aircraft with all the latest specs and a new PT 6. 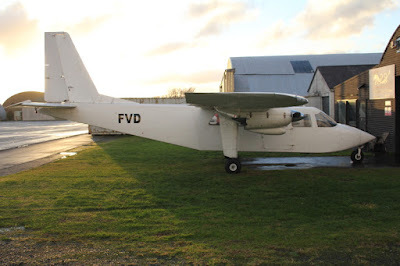 It was assembled by Avcraft in Feilding in June 2018 and pilot Andrew Cuttance told me that it had 17 hours on the hour meter. Bob Monds then took it for a few circuits. and being light, the performance was impressive. 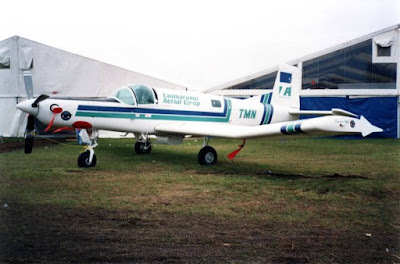 And the second Airtractor AT 402B was Rural Air Services (1986) Ltd's ZK-RMW3 (c/n 402B-1165) which is flown by Bob Monds. We have eight Airtractors currently registered in New Zealand - five AT 402Bs, two AT 502Bs and one AT 504. The classic textbook cold frontal passage ? I recall from my youth - and yes I can remember back that far - that a Cold Front approach consisted of a wall of very black cloud moving in from the South/Southwest more often than not with a well defined 'Roll Cloud' along the leading edge. If you were lucky you could see the row of Cumulonimbus anvil tops as well. The actual arrival consisted of a healthy squall followed by precipitation of rain or maybe hail often accompanied by thunder and lightning. Then usually a rapid clearance behind with a cool south/southwesterly wind. For many years now all we seem to get is a layer of low stratus and a wind change but little or no significant weather until maybe three or four hours later. On Sunday however I was parked outside the local supermarket, waiting - as you do - for the Mrs, when a 'real' cold front arrived. The above photo actually shows the back end of it as it races away towards Kaikoura and later Wellington. A recent arrival in the South is Robinson R44 Raven II ZK-HPO5 (c/n 13486). 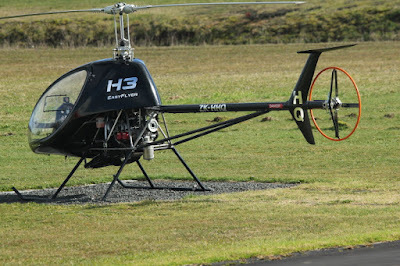 As mentioned in a previous post this was originally VH-HCL4 with Heliflite Pty Ltd of Sydney from 16-10-2013. 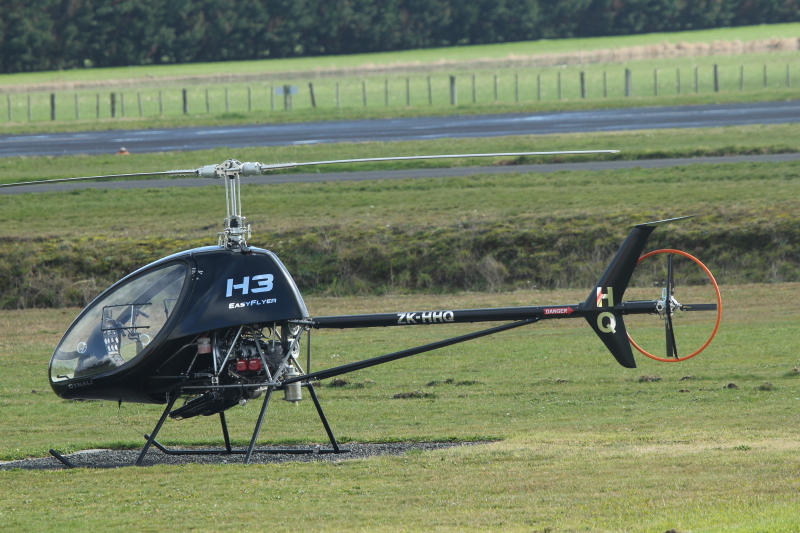 It entered the NZ register as ZK-HPO5 on 02-07-2014 with John Smith of Warkworth. 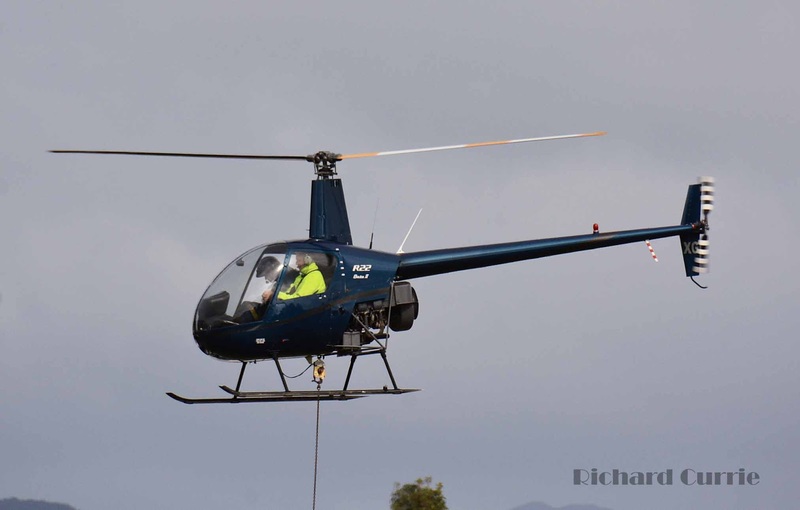 An ownership change listed on 13-07-2018 has it now placed with Kaikoura Helicopters Ltd where it replaces ZK-HLE2. 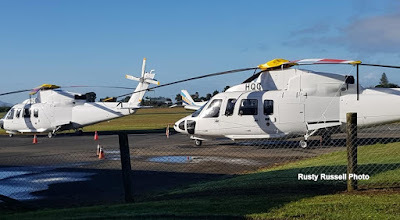 It was noted above at Heli Maintenance Ltd Christchurch on 30-07-2018. Britten-Norman BN2A-26 Islander ZK-FVD msn 316 photographed at Ardmore on the evening of 29-7-18 devoid of titles.This aircraft owned by Great Barrier Airlines is I believe destined for a new life in Vanuatu. On a blustery Manawatu afternoon topdressing aircraft were safely parked away including the resident Cresco ZK-PWT (c/n 010) at Hallett Griffin's base at Kairanga, just outside Palmerston North. ZK-PWT is now owned by Aerospread Ltd of Napier, having been registered to them on 8/2/18. Aerospread have purchased Hallett Griffin's aerial topdressing business with Hallett continuing aerial spraying as Griffin Ag Air Ltd. Hallett Griffin had owned the Cresco under Kairanga Aviation Ltd ownership since 27/8/98 and the registration was changed to ZK-PWT on 1/7/99. Ownership then changed to Griffin Ag Air Ltd on 23/7/09. 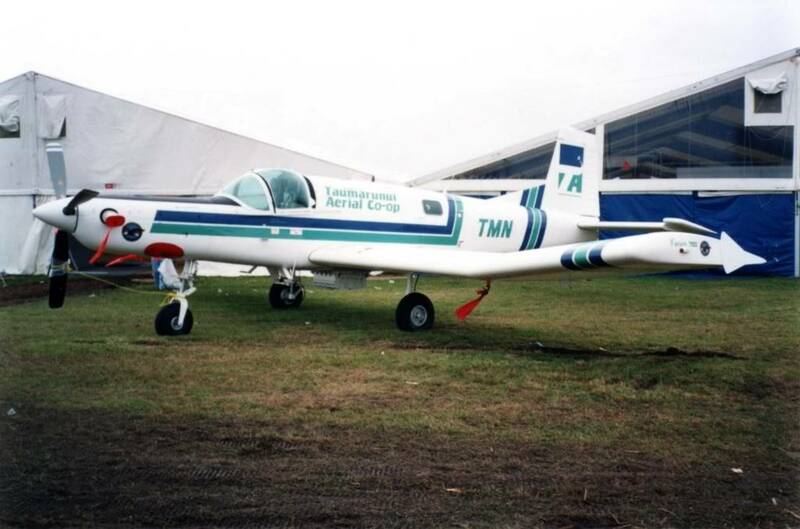 This aircraft was the first PT 6 powered Cresco and originally was operated by the Taumarunui Aerial Co-operative Society Ltd of Taumarunui, being first registered to them on 6/11/92, and it is photo'd above at the 1992 Aviation Expo at Auckland International airport. (Photo from the Wings Over NZ Cresco thread). 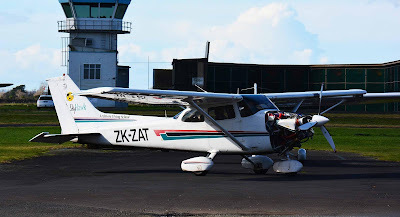 First time noted at Pauanui Cessna A185F ZK-JKL paid a very fleeting visit late afternoon. It was acquired by a Tauranga owner earlier this year. I was pretty surprised to see a business jet when I visited Feilding aerodrome last Thursday. It was the Wellington based Cessna 650 Citation III N163JM that was at Avcraft for maintenance. Mat Bailey of Avcraft told me that the strip looks pretty short on approach but that they fly it in pretty light. The sealed runway at Feilding is 1000 metres long. 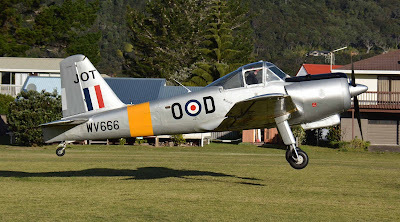 The recent weather in Wellington was pretty typical for winter, but on the Wednesday afternoon there was some flying by the Wellington Aero Club and a surprise to me. 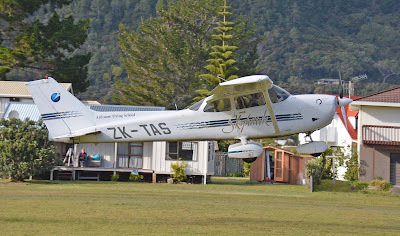 PA 38-112 Tomahawk ZK-WAC3 was painted in a new colour scheme reminiscent of Air New Zealand's colours. I guess that is appropriate as they often have to wait for an Air NZ planes - in this case the Tomahawk had to wait for a long time before it could taxy onto the runway for take off. 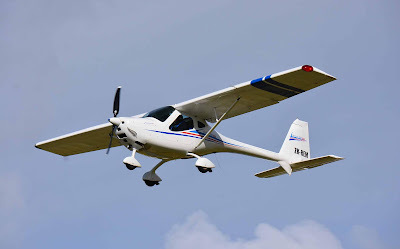 This could be a future trend for Wellington Aero Club as several of their aircraft are in rather anonymous white colours. ZK-NZF3 was parked up outside the Air New Zealand Engineering Services hangar on 23/7/18. It was still there on 28/7/18. On another trip down to Wellington I was pleased to see Air Chatham's recently acquired General Dynamics Allison Convair 580 ZK-KFL (c/n 372) outside their maintenance hangar. It has been painted with a large Chatham Island mollymawk head on the forward fuselage, and shaded feathers on the tail. The aircraft is a dedicated freighter used on internal New Zealand runs and also out to the Chathams. And sister ship ZK-KFH (c/n 42) was in an adjacent hangar in all white, so I reckon it will be one to watch in the future. 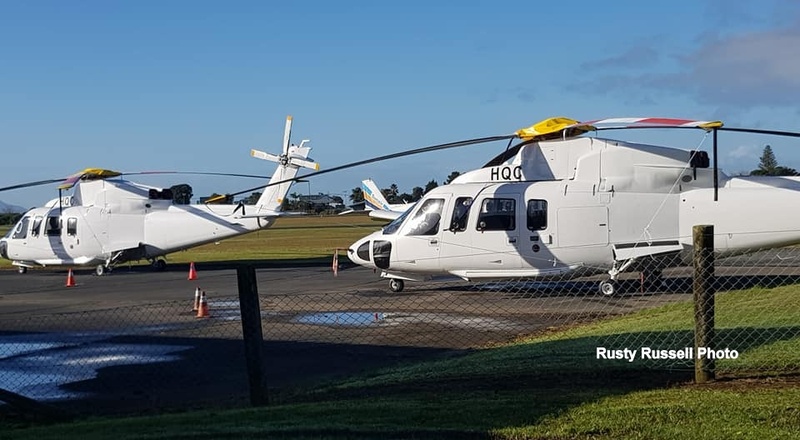 An interesting visitor from afar to the Pauanui airfield today was the Robinson R22 ZK-HXG, which is registered to a Greymouth owner. It spent the day doing sling work in the nearby Tairua hills. Another Cessna 172R of the Ardmore Flying School fleet, ZK-ZAT, is currently having its diesel conversion completed as noted yesterday. A couple of interesting LSA's in for coffee from Hamilton today were the Remos G3NZ ZK-REM and Aeroprakt A22LS ZK-SAJ, the latter being imported earlier this year. 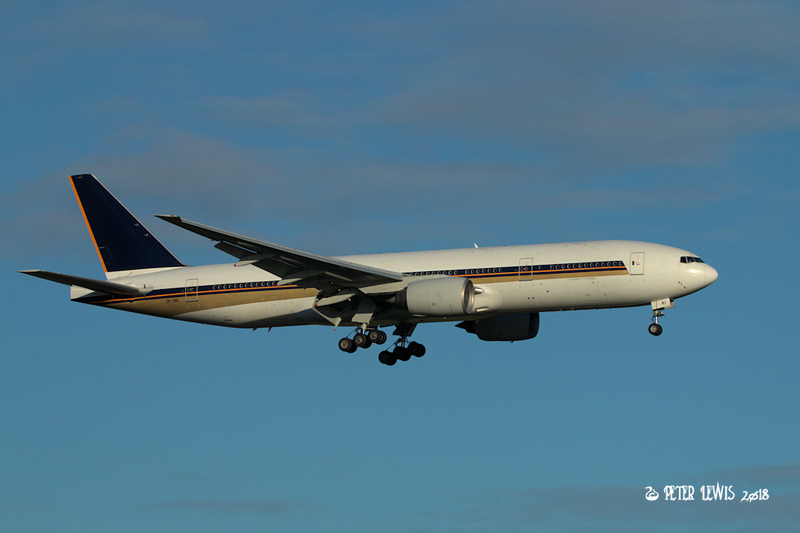 Captured today, Air New Zealand's short-lease Boeing 777-212 ZK-OKI ex 9V-SVL arriving in Auckland from Honolulu as flight NZ09. ZK-MXT2 is photo'd above outside Doug Brooker's hangar at Ardmore on 19/11/08. After importing his even more all out aerobatic MXS in 2015, he sold the MX 2 to the USA where it has become N303MV. 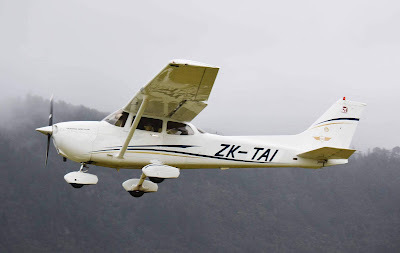 ZK-MXT2 was cancelled from the New Zealand register on 16/11/15. 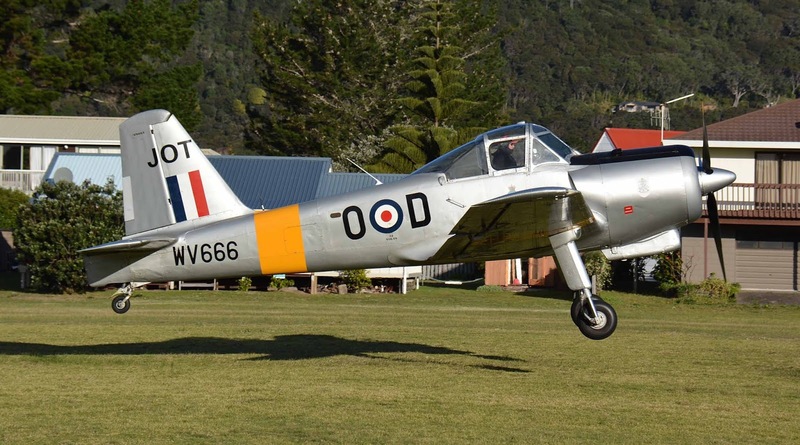 A period of settled weather brought some visitors to the Pauanui airfield, the star being the Provost ZK-JOT which arrived on Friday afternoon, and left Saturday for Tauranga. The next type of Amateur Built Aircraft to be registered was the Westland Bush Plane which was constructed by Russell Cook of Kaihinu, just North of Hokitika. 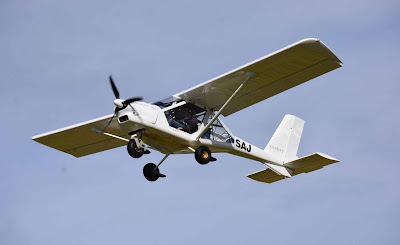 It is obviously from Piper Cub stock but I understand that it is a bit bigger than a Cub. One distinguishing feature is the slightly revised rear window shape with an additional cargo door below that I assume would be for loading longer cargo. I do not have dimensions or performance data for the aircraft but it is certified for a MAUW of 793 Kg which is the same as a PA 18A-150 Cub. It was obviously built for use on West Coast river beds with those big tyres. ZK-WBP (c/n 0017251) was registered to Kaihinu Aviation Ltd of Hokitika on 17/4/07. It can be seen in the above photo, taken at Omaka on 23/12/11, that it is marked as "Back Country Explorer" on the fin (click on the image to enlarge). 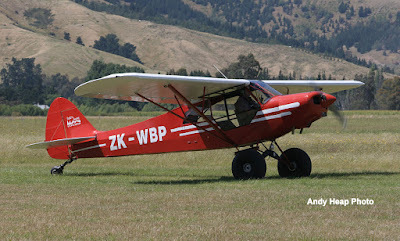 The Westland Bush Plane is another one of the many Cub lookalikes that we have had in New Zealand including Wag Aero Cubys, a back Country Cub, Carbon Cubs, Zlin Savage Cubs. the Classic Adventurer CA 18 and Light Miniature Aircraft Cubs (including a couple of full size LMA 5X-Ws that I will post about soon). Robinson R44 Raven II ZK-IJB1 (c/n 10267) was registered to the NZ agents - Skysales Aviation (NZ) Ltd of Christchurch on 03-03-2004 and was transferred over to John Butterfield (the JB in the registration) on 29-04-2004. Above we see it outside Heli Maintenance at Christchurch on 25-03-2004. Below it at Pacific Aircraft on 28-09-2012. It was sold to Macsil Deer farms Ltd of Christchurch and re-registered as ZK-HWT5 on 07-05-2018. Above we see it today at Heli Maintenance in its new identity. Below is a closeup of the graphics on the mast. Macsil also have the Robinson R22's ZK-HXN2 and ZK-HDX2 listed. Aeroprakt A-22LS ZK-NRH2 (c/n 317) was first registered to Nicholas Hitchins of Christchurch on 12-06-2018 and was noted out today at Rangiora. Also chugging around were the regulars Piper PA-18A-150 ZK-BNX (c/n 18-5453) of the BNX Syndicate. And the Rans S-6S Coyote II ZK-MLD (c/n 09991341) now in the hands of Chris Dyer. The wing taper shows up well in this view. 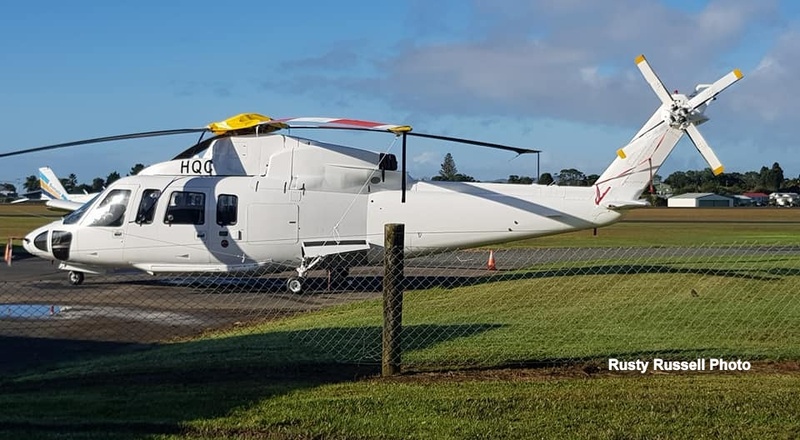 The Northland Emergency Services Trust registered two replacement Sikorsky S 76C helicopters on 2/7/18. They are to replace two of their three existing S 76As. ZK-HQC5 (c/n 760743) is ex C-FYDD. and ZK-HQO4 (c/n 760711) is ex C-FWOX. 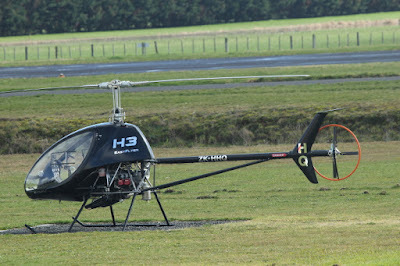 The next of the many types of sport aircraft to appear in New Zealand in the early 2000s was an example that we have had only one of - the Fly Italia MD 3 Rider. This aircraft was designed in the Czech Republic by Jaro Drostal and the first prototype flew in 2004. It was originally built by GRYF Aircraft in the Czech Republic for Fly Italia which was based in Dovera in NW Italy but this arrangement stopped in 2006 and when Fly Italia went into receivership in 2011, the aircraft continued to be built by Next Aircraft of Rivanazzano also in NW Italy (almost next door). The aircraft was marketed as the Sport Rider in the US. The MD 3 Rider is a conventional all metal high wing side by side with a steel fuselage frame and rivetted aluminium rear fuselage and tail, tailplane and wings. The curvy bits are from composites including the cowlings, doors and wingtips. One difference is the forward swept wings. the aircraft's length is 5.9 metres (19 feet 4 inches) and the wingspan in 9.0 metres (29 feet 6 inches), with a wing area of 106 square feet. Empty weight is around 287 Kg (663 pounds) and MAUW in NZ is 472 Kg (1,042 pounds). With a 100 HP Rotax 912ULS cruise speed is around 115 mph, while the stall speed is 40 mph. 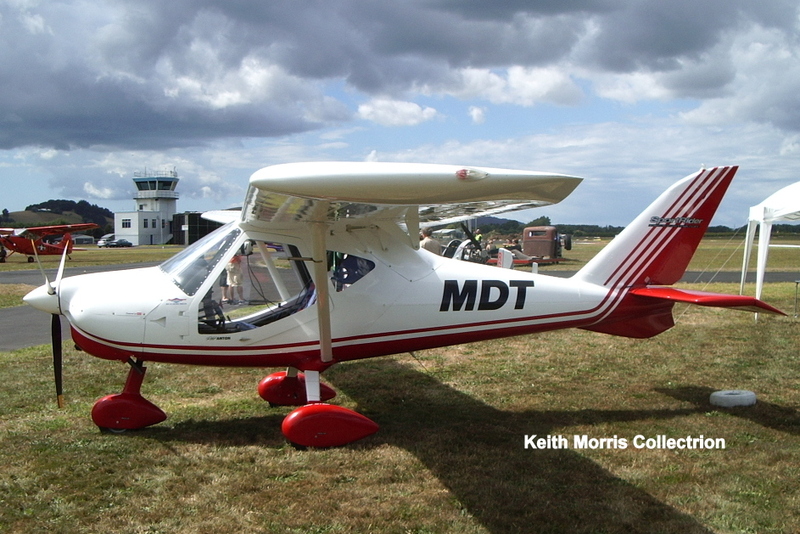 ZK-MDT (c/n 031) was first registered to Aerosport Aviation Ltd of Cambridge on 7/12/06. It was previously registered in Italy as I-8453. It has spent all of its life in the Waikato - it was sold to Gentle Properties Ltd of Cambridge on 2/4/07 and then to Arnold GP Ltd of Cambridge on 19/2/10 and most recently to the MDT Syndicate of Mercer on 20/3/12, with whom it is still current. It is photo'd above at an air expo at Ardmore on 3/3/07. 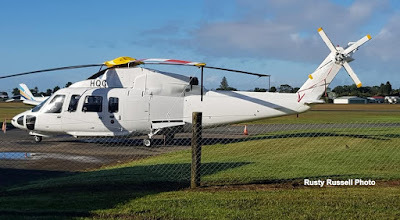 Dynali H3 EasyFlyer Sport ZK-HHQ msn H3-61-1740 of Karaka Helicopters Ltd, RD 1 Papakura seen at Ardmore early afternoon on 17-7-18. This Belgium made Ultra Light Helicopter was registered here on 28-5-18. I have seen it twice at Ardmore recently on a trailer arriving at and leaving from the airport but today is the first opportunity to photograph it. This is a follow on from an earlier post by Sir Minty Here which contained a subtle hint that I should do a little history on ZK-BCP. 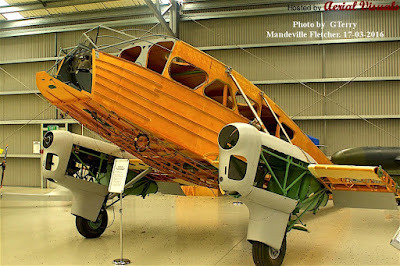 De Havilland DH89B Dominie c/n 6648. This airframe was constructed by Brush Coachworks Ltd at their Loughborough, Leicestershire plant under contract No.65/Acft2580/C20a and was taken on charge by the Royal Air Force with the serial of HG649 and listed with 76 Maintenance Unit on 19-05-1943 for crating to ship to NZ. It was shipped to New Zealand (along with NZ523/ZK-AKS) aboard the SS Sussex on 04-08-1943 reaching Auckland on 05-09-1943. I would imagine it was barged over to Hobsonville for re-assembly and where it was taken on charge by the Royal New Zealand Air Force as NZ524 on 08-09-1943 by Unit 36. It was issued to the Central Communication Flight at Rongotai from December 1943 until going up to Fiji from 18-10-1945. Shipped back to NZ aboard the Sheafe Holme (built 1929 - Broken up May 1965) reaching Auckland 22-08-1947 and barged to Hobsonville again. Late that month it was issued to the General Purpose Flight at Rongotai and shortly there after to 41 Squadron at Ohakea. 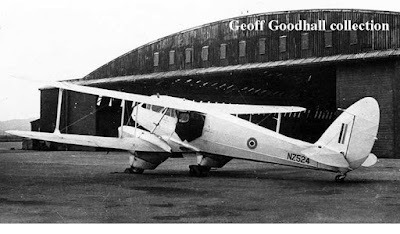 It was sold by GTSB tender to Airwork (NZ) Ltd of Christchurch who registered it as ZK-BCP on 17-12-1953. 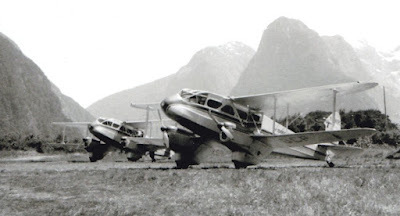 A NZ C of A was issued on 01-02-1954 and it served Airwork through until February 1956 under their South Island Airways name to operate alongside their other DH89 ZK-BBP. 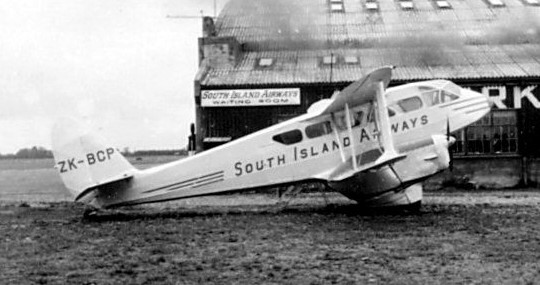 Below - we see ZK-BCP in South island Airways titles at Christchurch, from the Ed Coates Collection. From 25-05-1956 it was listed to Trans Island Airways Ltd of Oamaru until being delivered up to Auckland on 11-08-1958 to Coastal Airways Ltd of Auckland with whom it was registered on 08-09-1958. By February 1959 it was down in Christchurch and listed to Brian Chadwick (who traded as Air Charter Ltd) on 16-09-1959. It struck a fence on landing at Queenstown on either 31-01-1962. 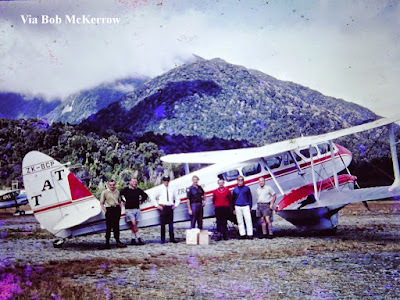 - with the Dominie ZK-BCP passing to the Estate of Brian Chadwick and I believe it was hired to the Canterbury Aero Club briefly before being sold to Southern Scenic Air Services Ltd of Queenstown from 07-07-1964. On 01-05-1965 SSAS became part of New Zealand Tourist Air Travel Co Ltd. It swung into a stop bank at Milford Sound during a downwind landing on 25-03-1965. Below we see it in TAT colours. Photo via Bob McKerrow. Then followed a change to Mount Cook Airlines Ltd from 01-01-1968. Below at Milford in 1969. It ground looped into a fence at Te Anau on 16-11-1969. I believe it was retired from Airline Service in late 1972 and stored at Te Anau. Then on 18-07-1973 it became Mount Cook and Southern Lakes Tourist Co Ltd. It was sold to Bill Waterton of C Tracy and Co Ltd of Melbourne on 31-01-1975. It was overhauled and noted at Taieri and had long range fueltanks fitted in December of 1974. Here we see it at Taieri on 06-12-1974 marked up in its full Australian registration of VH-BGP - upper and lower wings as well. I visited Taieri again on the 11th of December 1974 by which time the 'VH' tail marks had been covered by taped 'ZK' markings. The wing retaining the full VH-BGP marks. Above we have the hose line running from the cabin tank to the filler cap. Above and below - full VH-BGP markings on upper and lower wings. It was ferried from Christchurch to Auckland on 14-01-1975, then on to Kaitaia and Norfolk Island on 19-01-1975 and to Brisbane on the 21st the pilot being Ray Cooney and the navigator was Tedd Allen It was flown to Melbourne the next day by owner Bill Waterton. 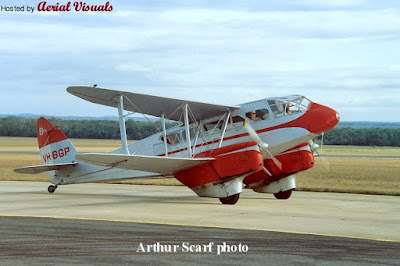 It was registered as VH-BGP2 on 31-01-1975 to C Tracey and Co Pty Ltd of Melbourne and then on to Joe G Drage of Wodonga, Victoria and placed in his aircraft museum with an ownership change taking place on 20-05-1975 to Joseph G Drage/Drage Historical Aircraft. 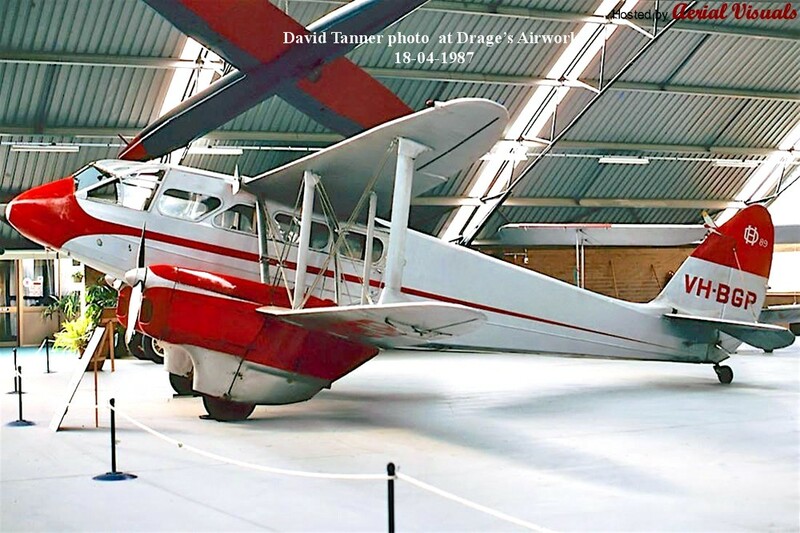 Joes aircraft collection was gradually moved to Wangaratta to the Drage Air World hangar with the Dominie flying there on 21-07-1985. As seen below by David Tanner on 18-04-1987 in the Drage Airworld museum. Below - seen on one of its outings at Nowra in 1991 by Arthur Scarf. It attended a few airshows until its last flight on 20-03-1997. 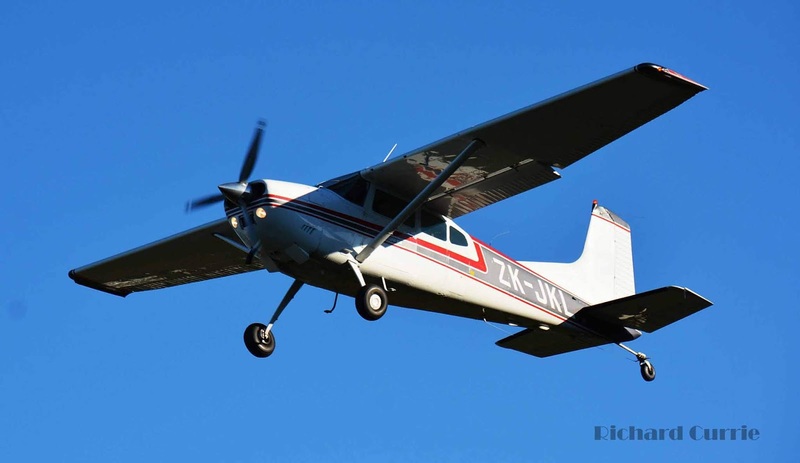 With the closure of Airworld the Dominie was noted for sale in December of 2002 and sold in 2004 to Bruce Ivers of Perth and registered to Dime Nominees Pty Ltd of Subaico, WA on 26-07-2004. It was containered over to Croydon Aircraft Company of Mandeville for slow rebuild reportedly with a new scratch built fuselage. Along with this note ! Photo below by Terry Fletcher at Mandeville on 17-03-2016. Not a lot of obvious progress here. It is still at Mandeville today. Brian Cox back in the Tiger Moth.